It’s been a busy Christmas season as usual. And this year there were a couple traditions we just didn’t make time for in the Horst household. But the one tradition I was sure to make time for was fun Christmas gift wrapping for my nieces and nephews. This year I decided to embrace pop culture, embrace current trends, and embrace my own childhood. That’s right—we’re talking about Star Wars. As a child this was one of my loves. My older brother collected all the good guy characters and spacecrafts, while I amassed all the bad guy pieces. Now I find my nephews and nieces enjoying it as well. My next decision was how to depict the characters. Faces would be very time intensive. Instead I focused on torsos, and in order to make that work I chose the characters that had the most recognizable and iconic outfits and designs. I had to narrow it down to six of them. These were easy choices for the most part. The hardest choice was deciding between Han Solo and Yoda, but in the end the fun of Yoda’s green skin won out. 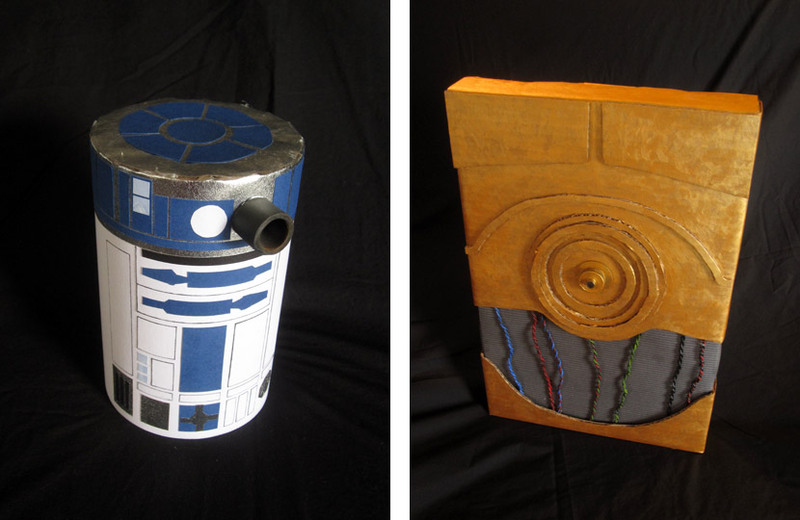 In building my version of R2-D2, I started with a very thick cardboard tube I had saved for years. It was then a fairly meticulous process of hot gluing and glue sticking various cutouts into the correct locations. A section of rubber tubing was used for his “eye” and metallic silver wrapping paper was the perfect reflective touch for his upper body. Rather than start with a cardboard box for C-3PO, I added layers of paper and cardboard right onto the gift (a board game). I left space between the gut area and the overlapping external shell which gave a nice sense of depth while also allowing room to place a few twisted wires. Fortunately my collage artist wife likes using gold paint and had plenty for me to use in finishing off this droid packaging. If you study Darth Vader’s outfit, you’ll notice the various shades and finishes of blacks involved, and that’s what I went for here. From the dull cardstock of the lower section, to the plastic sheet used for his neck shield, to the fabric of his cape, it all comes together to form a very recognizable villian. But key to Vader is the control panel in the middle of his chest. Various hardward connectors were recycled and painted to assemble this feature. Luke’s outfit is very straightforward, so I avoided any unnecessary embellishments. I simply took a white pillow case which I wrapped and tucked, then made a simple belt. Done. I didn’t even have to cut the pillow case. 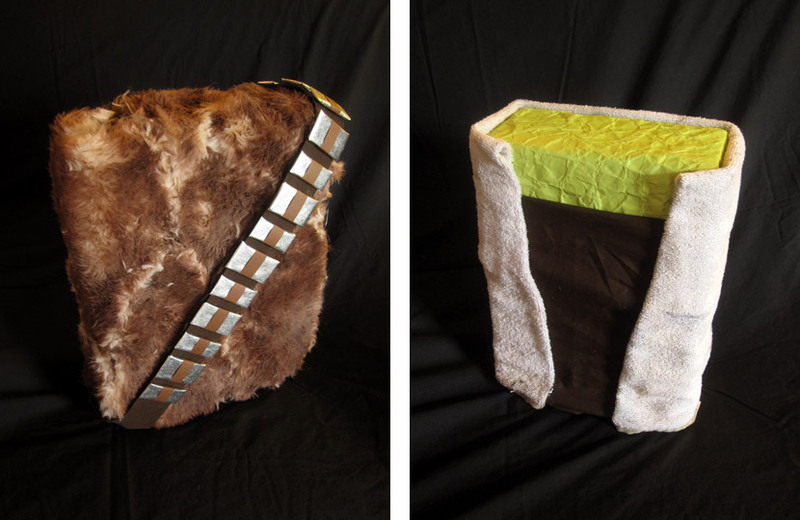 Chewie’s bandolier was a simple thing to assemble using hot glue and various scraps of silver paper and cloth. The challenge was wrapping this gift in fur. I didn’t have sheets of wookie fur on hand, so I had to improvise. I took an old stuffed animal—a rabbit—and basically skinned him. It got a bit messy as the hair at the edge of my cuts would easily rub off, but it worked. I cut off sections, keeping them as large as possible. The fur was light yellow so I rubbed brown acrylic paint into each piece in order to achieve the desired color. The pieces were then hot glued into place. Credit again goes to my collage artist wife as she has so much paper. She had a couple sheets that were the perfect shade of Yoda green. Even better, it was cardstock. So I took those sheets and crumpled them up multiple times, flattening the sheet between each crumple to assure new creases would be formed. This was an easy yet effective way to create Yoda skin. 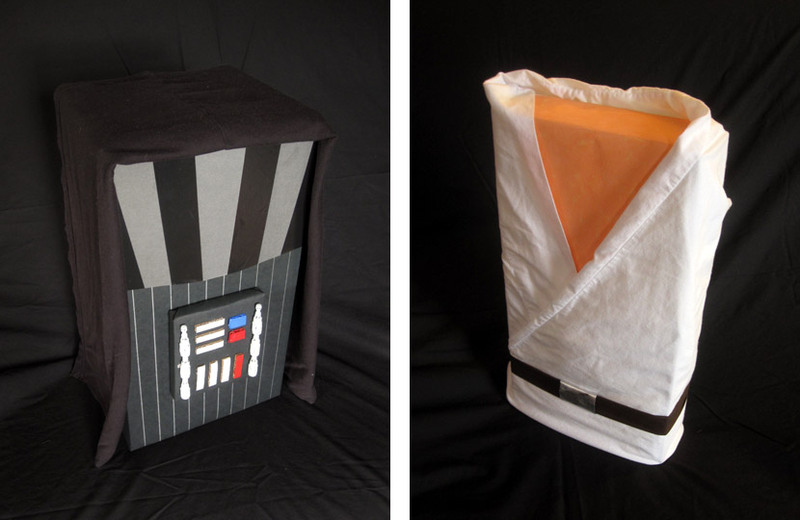 A couple layers of cloth and this miniature Jedi was complete. Though some of the packages were a challenge to open, the children enjoyed the process and have come to know that’s part of the fun. My nieces (who are older and love Star Wars) used caution in opening their gifts so they could keep the packaging on display in their nerdy bedrooms. 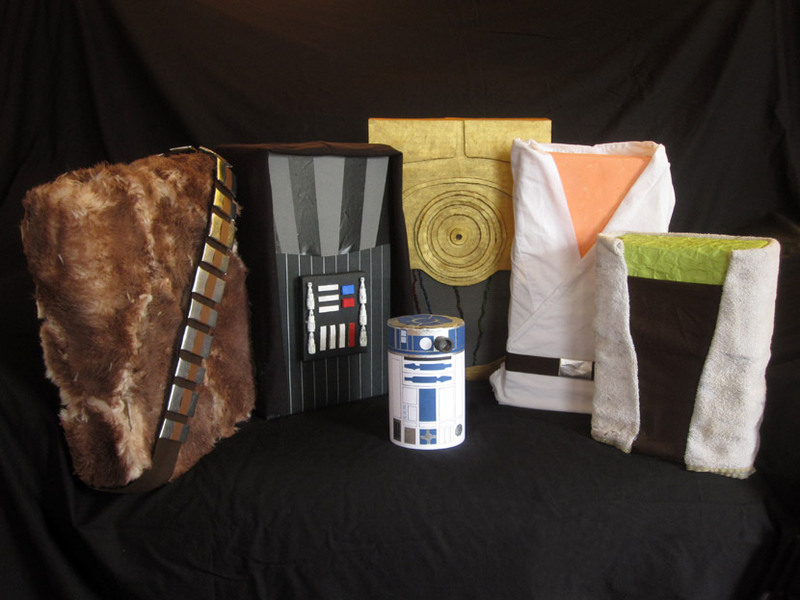 Be sure to check out my Christmas gift wrapping from previous years—merry Christmas! As a GIANT nerd, all I can say is WOW !! This is amazing. Really amazing. Those who received those gifts will remember that forever. Lucky them…..